As I attempt to get more online content posted and cataloged I will be adding links and information here. 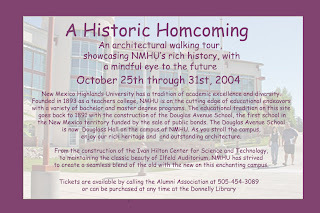 This is a short video I created for use on the web for promoting the bi-annual Iron Tribe Exhibition at New Mexico Highlands University, in 2005. Iron Tribe is the brainchild of David Lobdell. It is a three day, fine art foundry event which includes; production pours, performance pours and lectures. 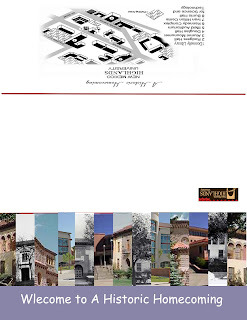 The Iron Tribe exhibits were a forerunner to the formation of the Western Cast Iron Art Alliance in 2008, composed of higher education arts professors. Lobdell co-founded the alliance and serves as its president. 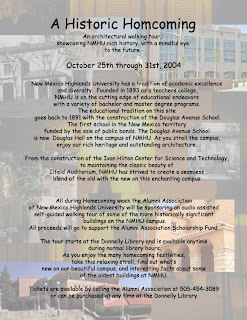 Postcard and tri-fold mailer designed to promote campus history walk during homecoming week.